Identity theft affects close to 15 million Americans each year. This number has increased dramatically with the rise of technology. Online identify theft is a convenient method for stealing consumer information from retail establishments and restaurants that process credit and debit card information. There was an incident that took place back in 2013 where Target was hacked and 40 millions of credit card numbers were stolen. This is a very sophisticated version of a more common problem, hackers are stealing credit card information and identities from almost everywhere. A very popular scam has been taking place at gas stations where hackers will install a physical component inside the pumps computer that captures credit and debit information has someone is fueling their vehicle. Apparently there is a universal key that is obtainable online that allows hackers to open up the face of the pump and hack the pump using advanced technologies. Start by never giving out your personal information to inbound callers asking for financial details or any other information that seems sketchy. In the same manner, do not reply to unsolicited emails asking for personal information, or clicking links in those emails if they were unsolicited. Install and maintain virus protection software on your computers, purchase them, and keep them up to date. Make sure that if you are using wifi in a public place that it’s password protected, and never access sensitive information like bank accounts on public networks. If you are making purchases online, confirm that the source you are buying from is legitimate and not a spoof site. Knowing the difference between http:// and https:// will help you to better understand where to make safer transactions. Secure your home network, install a firewall, and password protect your wifi and all personal computers in the house including kids computers, laptops, tablets, phones, and anything else that can be accessed through your network. Putting computers and other electronic devices that live on the network “to sleep’ is a great way to keep the devices off the network while they are not being used. If at some point the computers, tablets, phones, or other network compatible electronic devices become outdated and you dispose of them, be sure to either pull the hard drive out yourself and destroy it with a hammer, or contract a hard drive destruction service to pick up your outdated electronics and dispose of them. Business like that have industrial strength hard drive shredders that literally shred the drives into scrap metal, leaving NO CHANCE for hackers to retrieve personal data off of those drives. 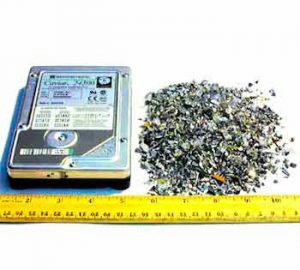 In the picture to the right you can see how impossible it would be for a hacker to steal any information from that hard drive after it’s been destroyed and shredded. If you have not been following these basic guidelines I suggest you start. No time like the present to secure your identity and your personal data. When you are out and about, it is suggested that you use your debit card as a credit card when possible. I have found that at the gas pump if I choose credit over debit it allows me to run the card as a credit card. In this case I only have to enter my city zip as opposed to my debit PIN number. I have made a habit out of doing this and so far, so good. Hopefully these few pointers and resources will help you make better decisions online, and out in public.